The future of college hoops in New Jersey looks bright as Rutgers went into the Prudential Center on Friday night and battled Seton Hall for two halves before the Pirates edged ahead behind Angel Delgado’s stellar last 20 minutes. Delgado ended the game with 19 points and 16 rebounds while winning the Garden State Hardwood Classic MVP trophy for the second consecutive year. Rutgers has been a perennial doormat in the Big 10 but that looks like that’s about to change with Steve Pikell at the helm. The first year coach inherited a young roster (only one senior) and he has his players buying into his system. They came to Seton Hall on Friday night and cleary were not intimidated by the sellout crowd of 10,481 screaming fans. Sophomore Rutgers guard Corey Sanders played exceptionaly well from the opening tip as the Scarlet Knights. He took the game to the Pirates early, beating them at their own style with slashing to the rim and defense. Rutgers held the Pirates scorers in check while getting to the free throw line on the offense side of the ball. CJ Gettys and Deshawn Freeman played the middle very effectively for Rutgers as they forced numerous misses from Delgado and Ish Sanogo in the paint. 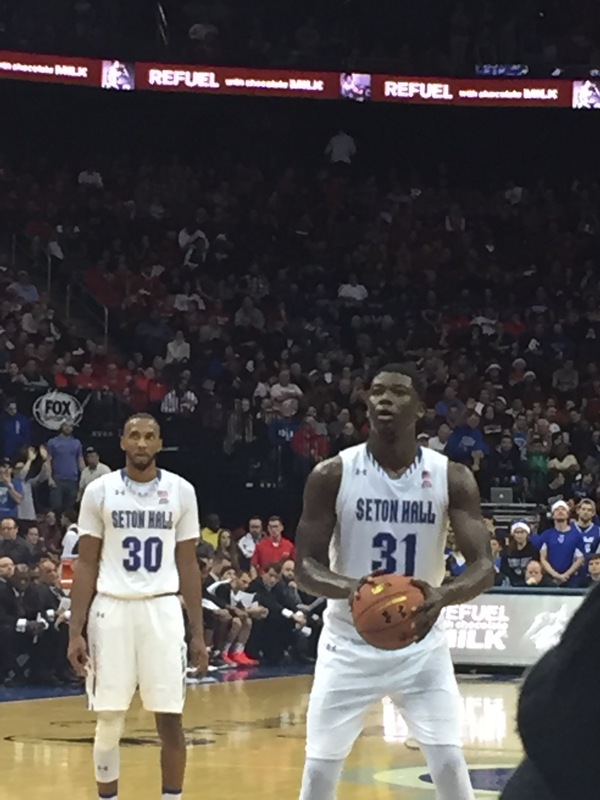 Seton Hall was visibly frustrated as they used different lineup combinations in the first half in order to generate some offense. None seemed to work as Rutgers went into the half with a 32-23 lead after a 13-3 run to close the opening stanza. The adjustments Kevin Willard made were evident immediately as the Pirates scored the first five points of the second half. Delgado started to get the Rutgers big men in foul trouble with his low-post moves. As the half progressed, Seton Hall guard Khadeen Carrington started to find his stroke from the floor and hit several jumpers to put Seton Hall ahead with 14 minutes left in the game. The game was all about Delgado’s ability to fight through a bad first half and find his game in the second half. It’s an encouaging sign of maturity for Delgado and his coach as the Pirates start Big East Conference play. Delgado’s talents with the ball have developed to the point that he should be a first team Big East player. For Rutgers, the guard tandem of Sanders and Nigel Johnson had 17 and 16 points. Carrington had 20 points and Desi Rodriguez had 12 points while sitting out the bulk of the second half in foul trouble.